#907 This table incorporates many of the style elements of the Greene & Greene Gamble House table of 1906 in an original design. 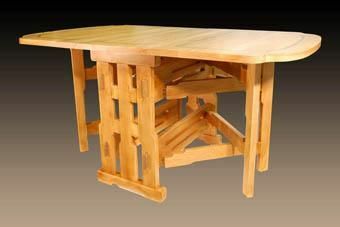 The design objective was to provide a very sturdy dining table suitable for small multi-purpose spaces while evoking the Arts & Crafts spirit of Greene & Greene. 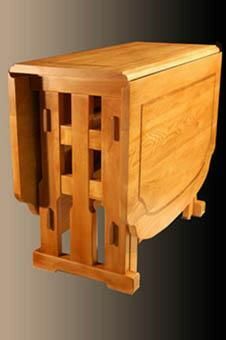 The tops are inlayed with solid walnut, the center posts have walnut through tenon plugs, traditional rule joints are used between the leaves and solid brass hinges are used throughout. 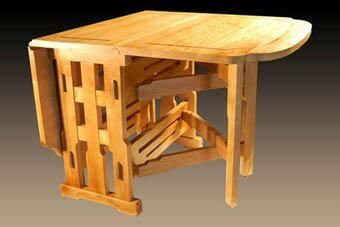 The top and legs are shaped similar to those of the Gamble House Table (#705). Stability is further enhanced by the full one inch thick top, and levelers on both the top and bottom of the four gatelegs. The bottom levelers serve the conventional purpose of compensating for uneven floors. The levelers at the top of each gateleg serve to balance the load between the two legs and to assure that the swinging top is aligned with the fixed center top. A positive stop under each swinging leaf is provided to index the gateleg position.